Robo-warriors have been a staple of science fiction movies and video games for decades, they also have been very useful in real-world operations on land, sea and air. Drone warfare, basically robots in the air, is already a major part of modern combat and ISR operations. The Navy uses Unmanned Underwater Vehicles (UUVs) in similar ways to their high-flying cousins, and has already tested humanoid fire-fighting robots. As reported in the last issue of Soldier Mod, USSOCOM is already testing a “robo-mule.” With all of these robots already in use, can a full-blown ground combat robot be far behind? Gen. Robert Cone, the Chief of the Army’s Training and Doctrine Command, said during the Army Aviation Symposium on January 15, 2014 that he strongly believes the Army’s typical combat brigade, currently at about 4000 troops, could shrink significantly over the next few years. Maybe by as much as a quarter, down to 3000 troops. He said robotic killing machines, basically ground UAVs, or drones, could very likely be used to make up the difference in the brigades and their squad teams. While humanoid “battle-bots” may still be a few years away, they are already making a difference for US Warfighters, not necessarily on the frontlines, but in testing labs. The US Military first revealed PETMAN in 2011, at that time a headless humanoid robot that was being used to test protective gear. PETMAN is an acronym for Protection Ensemble Test Mannequin. The military has always used mannequin-like “suit testers” to evaluate the effectiveness of protective clothing without putting troops in harm’s way. But according to the creators of PETMAN, previous suit testers were basically little more than very sophisticated puppets that had to be supported mechanically by wires and tethers. PETMAN, on the other hand, balances itself and moves freely; walking, bending and doing a variety of suit-stressing calisthenics during exposure to chemical warfare agents, much more closely emulating the range of motion of an actual person. A video showing the astounding range of motion of the latest PETMAN, can be seen here: https://www.youtube.com/watch?v=tFrjrgBV8K0#t=52. 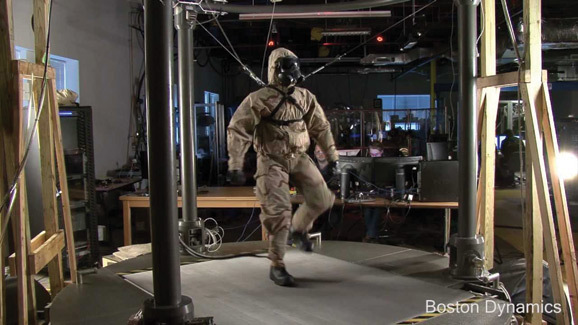 DARPA is taking the idea of military robotics very seriously. They have sponsored an ongoing Robotics Challenge Program. The DARPA Robotics Challenge (DRC) is a competition of robot systems and software teams vying to develop robots capable of assisting humans in responding to natural and man-made disasters. DARPA will announce the location and date of the DRC Finals in the months ahead, but for now says it plans to hold the event between December 2014 and June 2015. Portable power seems to be the greatest challenge coming out of the competition so far in developing a truly autonomous robotic soldier. Beyond that, once all practical issues are worked out, what about the ethical concerns of a true combat ready “robo-warrior?” Will human troops be willing to fight alongside them? Will they be sophisticated enough to distinguish friendlies from other targets, can they be hacked by the enemy and turned against their masters, or any number of other “Sci-fi” scenarios. However the competition plays out, and these issues ultimately addressed, one thing is clear, expect robots and robot derivations to play an ever increasing role in modern warfare. The private sector is also willing to bet on a solid future for military robots. Internet giant Google recently acquired Boston Dynamics, along with several other leading edge robotics companies.